Belle of the Ball or "Bolt" as we call her is a sweet heart. 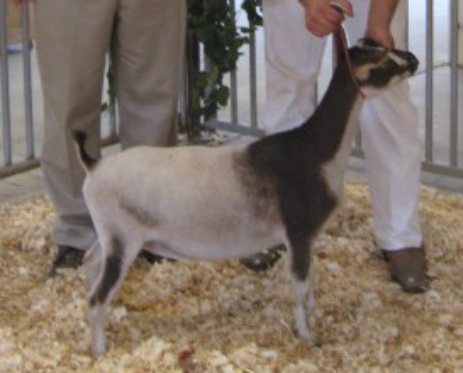 She is more of a 'pet' than a show animal, but she does compete well in the show ring. Bolt was the 2nd place Senior Dry Yearling at the ADGA National Show to the Junior National Champion. She was undefeated as a kid going 4x Grand, and this year she has 3x Reserve, 4xGrand, and 1xBDIS. She has a beautiful topline and front end, along with a nice rump with plenty of width throughout! In the first show out, she went 1x GCH, 1xBOB.